The IMS v1 is your starting point into inventory management vending machine equipment. This medical supply and IT vending machine includes all the same features as our popular IMS Pro medical vending machine model, minus the automated elevator system. If your products are light weight and wont break or damage from dropping off the shelves then this is the model for you. All trays and selections are fully adjustable to maximize machine capacity. All of Global Vending Group's IMS Vending Machines ship with fully a integrated inventory management hardware/software package and is fully scalable due to its modular design. 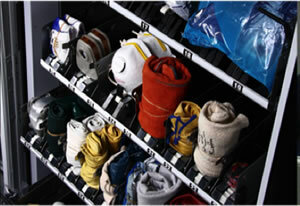 Click the button below to add the IMS v1 Inventory Vending Machine to your wish list.